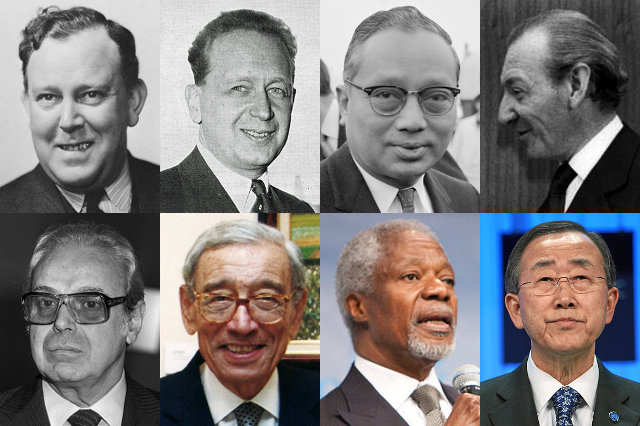 The Secretary-General of the United Nations is the head of the Secretariat, the body’s executive arm. The position is also usually seen as the head of the United Nations itself. The term is five years; traditionally, two terms is the maximum. In the past, appointments have been compromise candidates between the five permanent members of the Security Council, in part because each permanent member has veto power. The process appears likely to change for the selection of the next Secretary-General, whose term will begin January 1, 2017. Other countries will probably have a say, although direct voting seems unlikely. Trygve Lie (Norway, 1946) – resigned in 1952 under pressure from the Soviet Union. Dag Hammarskjöld (Sweden, 1953) – killed in a plane crash in Northern Rhodesia (now Zambia), 1961. U Thant (Burma, 1961) – at 10 years, 1 month, the longest-serving Secretary-General. Declined to stand for a third term. Kurt Waldheim (Austria, 1972) – China vetoed his third term; it later came out that he was a suspected war criminal. Javier Pérez de Cuéllar (Peru, 1982) – compromise candidate; China preferred Salim Ahmed Salim of Tanzania. Retired after two terms. Boutros Boutros-Ghali (Egypt, 1992) – United States vetoed his second term. Kofi Annan (Ghana, 1997) – in 2012, served as U.N. special representative to Syria, but quit over “finger-pointing” in the Security Council.